Canine periodontitis is a bacterial infection of the mouth. There are four stages of periodontal disease, progressing from plaque and mildly inflamed gums to established gingivitis (gum disease), and then on to mild and ultimately severe periodontitis, which may involve bone and/or tooth loss. But with a good at-home dental care routine and regular professional dental cleanings, you can help prevent your dog from getting dental disease. Does your dog have stinky breath? This is one of the early signs of periodontal disease. 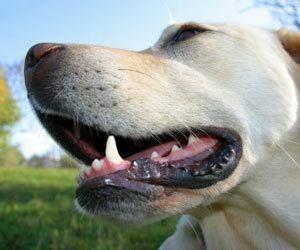 Does your precious pooch have red or swollen gums? 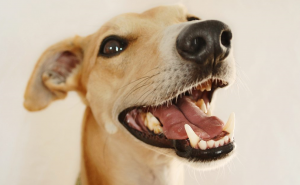 Are your canine companion’s teeth yellow or brown? Loose or missing? How’s your dog’s appetite—still a chow hound? Different? Having trouble chewing bones? Losing weight? If you answered “yes” to any of the above questions, your pooch could have periodontal disease. But don’t worry, help is here! Brush your dog’s teeth regularly to help reduce plaque, a sticky film that contains bacteria. Be sure to use toothpaste that is formulated for dogs. Visit your local veterinary hospital team for regular professional dental cleanings. This will reduce bacteria and help guard against periodontitis. Give your dog chew toys and perhaps consider dog food specially formulated to address dental disease. You can also provide your pet with chew treats treated with enzymes that help reduce the formation of tartar and calculus. The chews do not take the place of brushing but is a great supplement and a treat for your pet. If plaque (the non-visible film on teeth) and dental calculus (the visible mineral deposits) are not routinely cleaned from pets’ teeth, they can cause gingivitis (painful inflammation of the gums), bad breath (halitosis), periodontal disease, and eventually, tooth loss. According to data found by Banfield’s Applied Research and Knowledge (BARK) Team, pets with periodontal disease are more likely to be diagnosed with heart disease as well as other forms of bodily organ damage. Periodontal disease is shown to have a relationship with heart disease, because bacteria from the mouth constantly enters the blood stream and adheres to the arteries surrounding the heart. According to this data, small dog breeds, such as Cavalier King Charles Spaniels, Dachshunds and Toy Poodles, are more prone to developing periodontal disease than larger breeds. Remember, if you notice bad breath, red or swollen gums, missing teeth or appetite changes, bring your pet in immediately for an examination.